Would you like to learn how to bake your own bread from scratch, make your own candles, garden successfully, can produce, make homemade soap, and grow and use herbs? 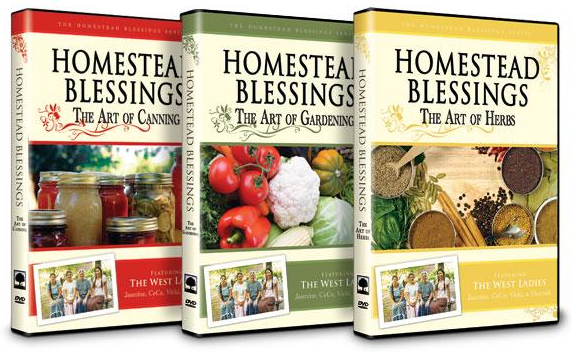 Freedom Film Distributors is giving away two 11-DVD sets of The Homestead Blessings Collection to my readers this weekend to teach you those skills and much more! Kathrynne, Kaitlynn, and I have enjoyed watching these DVDs over and over and over. We’ve learned hundreds of new tips, we’ve been fascinated at the immense knowledge the West ladies have, and I’ve been inspired to think that even I — someone with little domestic creativity and ability — could pull off some of these things. In fact, partially inspired by the West Ladies, my sister and I made homemade soap last year. Our big batch is finally used up, so we’re planning to make another big batch in the next few weeks. Whether you are a novice or a pro, I guarantee you’ll learn something from these DVDs – and you’ll enjoy them, too. 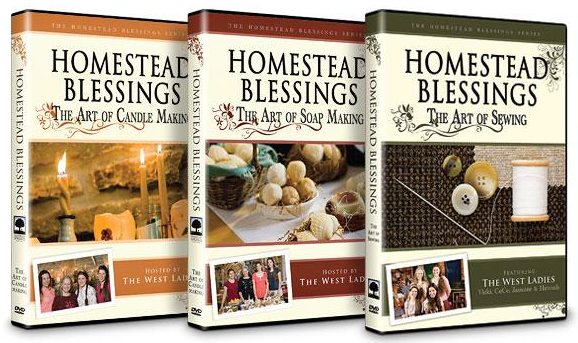 If you know someone who loves old-fashioned arts or would love to learn new homemaking skills, these DVDs would be the perfect gift for them. They are down-to-earth and packed with information and creative ideas. The eleven-DVD set includes instruction in bread making, candle making, soap making, canning, gardening, herbs, cooking, dairy, quilting, and sewing. This deeply discounted set is the perfect tool to teach a wide-range of valuable and fun skills that will last a lifetime. To enter to win The Homestead Blessings 11-DVD Collection, just click on the graphic below and type in your name and email address.Two winners will be chosen and posted on Monday. This giveaway ends Sunday, May 6, at 11:59 pm, CST. This would be so very helpful to have in our home! thanks for a chance at winning! A giveaway that just keeps on giving!! I’ve watched several small segments via YouTube….ready to have the collection for my home! Especially for help starting our own garden. Well, and developing my sewing skills further. And soap making. Well, all of them! This is an awesome give-a-way! I could use watching everyone of these. OH MY I HAVE WANTED THIS SERIES FOREVER JUST HAVE NEVER BEEN ABLE TO FORK OVER THE MONEY FOR IT! Oh my yes, me too! I’ve wanted these for so long! I hope I win!! 🙂 weren’t you expecting a baby at the same time I was last year? I thought I remembered comment on a maternity clothing post to each other. My grandmother raised us and was blind. Her key to functioning was to have everything where she KNEW it was and not have us moving it around. Cookies with red pepper rather than cinnamon were not tasty! We never learned homemaking skills and this has been a HUGE challenge to me in my adult life. These videos would be a great resource to someone wanting to learn…. Thank you so much for offering these! I’ve seen them reviewed before and would be thrilled to have them. We have watched three of these videos from our library and really enjoyed them.Owning them would be a great resource for our homeschool library. These look like very useful, entertaining and well produced videos; they are a very tempting expense. However, I have a philosophical question for you, Crystal. Even at the “deeply discounted” price of $135. that is still a lot of money for the homemaker with an average household income who needs to make every penny count. In your opinion, would spending $135. on these videos be a prudent use of limited resources? Would the information gained save the frugal household budget the cost of these videos, or could this information be gained more frugally elsewhere? Does $135 seem like a lot of money to you? Thank you very much for your insights about these videos, and for the caveats about the soapmaking and canning instructions. I try to use my resources wisely and I really appreciate your candid response. I’ve looked at these several times daydreaming! How awesome for a chance to win the ENTIRE collection!! Woot! Looks like a good resource! Thanks for the giveaway. what a cool give-away! crossing my fingers and toes. Thank you for offering such a wonderful give-away. As a mom just starting out I want to win this so bad! I have have my eye on them for a while.